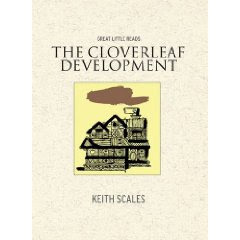 A short while ago I had the great pleasure of reading The Cloverleaf Development in Roast Book's 'Great Little Reads'. I'd also read another one of Keith Scales's stories in 'Little Roasts' - an anthology of short stories - and been most impressed. Both of these stories take place in a town called 'Overlook', and in the interview below Keith Scales has been kind enough to tell me a little more about his fictional town, and how he came to invent it. Born in London, Keith Scales has been a merchant seaman, laboratory assistant, bartender, labourer in factories and a quarry and a few other things he would rather not elaborate upon. 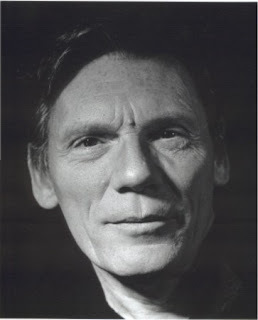 In 1970 he settled in Oregon, working as an actor and director, where he performed in over 200 plays and directed nearly 100, receiving many awards. 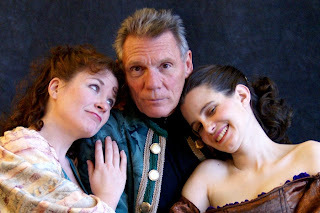 His play, What Mad Pursuit, was a finalist for the Oregon Literary Arts Award for Drama. 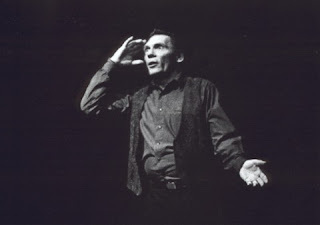 From 1993 to 2009 he was artistic director of the Classic Greek Theatre of Oregon. He has now moved to Arkansas to direct a new company, Shakespeare in the Ozarks, and write. Interview About the Overlook Stories. CD: How long have you been writing about Overlook? Where did the name come from and how did the concept of the town evolve? KS: I started with a story called “Cairns” in 1998. I had been travelling around Oregon and Washington giving Chautauqua lectures about W.B.Yeats and Shakespeare. I would see piles of stones in fields with no purpose that was apparent to me. While they were probably the debris from land-clearing they reminded me of prehistoric cromlechs or dolmens. So as I drove I started to imagine an old Irishman “without the full shilling” who hauled rocks across the land into piles, without knowing why. One day he and his wife go missing and their disappearance is investigated by the local sheriff, who is not a lot brighter than the Irishman. That imaginary incident developed into a story about a small town in which everybody knew each other and in order to get along with each other tended to overlook each other’s foibles and quirks and, when it was convenient, the truth. Another image that stuck with me was that of a person on horseback leaning down to talk to some one in the cab of a truck– time seemed to be suspended, or rather, all happening at once. Overlook City is similarly out of time, by being in many times. That makes sense, doesn’t it? 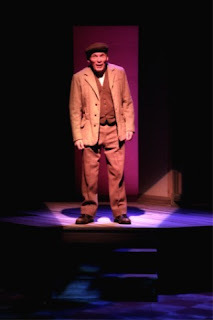 I have worked in the theatre – mainly period and modern classics – for nearly forty years, and have an abiding interest in mythology. Studying the lives and works of the great dramatic writers, as an actor and director, was inspiring but intimidating. One day William Stafford (now gone from us but at that time the poet laureate of Oregon) told me that his advice to students who were too critical of their own work was “lower your sights.” So instead of continuing to try to be James Joyce or Euripides, I turned to short stories and genre fiction, and immediately felt comfortable enough to write for my own amusement. Overlook was the unexpected result and first fruits of many years spent looking for what I wanted to write. I’ve also written a couple of novels, a couple of plays, a couple of screenplays, English versions of fifteen ancient Greek plays and many other short stories – but I always come back to Overlook. CD: Is it based on anywhere in particular? Do you have a region in the US in mind? KS: The Pacific Northwest. Part of the charm of the rural towns in those states is that you feel like you’re in a western movie - cowboys, horses, boardwalks, empty landscapes. When I was growing up in London my mother worked in a second-run cinema and I spent many evenings of my early teens watching black and white movies, many of them westerns. So Overlook has its origins in fantasy and fact – early cowboy movies and modern rural America - and is not particularly faithful to either. CD: Why did you choose a US town rather than say an English one? What are the basic differences between a small town in the US and one in the UK? KS: I have lived here for a long time now – almost forty years, and have been exposed to a lot more small towns in the US than in the UK. And when I did live “over there” I was more interested in big city life, or faraway exotic locations. I visit England, infrequently, and have a great love for the villages. My long-time sweetie Rebecca and I recently moved from Oregon to a beautiful little artists colony in Arkansas called Eureka Springs (well worth the Google) which reminds me of nowhere so much as Glastonbury, or somewhere in Cornwall – narrow hilly streets, limestone cliffs, meticulous gardens. But I think if I were to try writing about an English village I would find myself trying to be Agatha Christie. At this point, it’s probably a toss-up where you’d find the most guns. CD: What else have you written about Overlook? Do you have an overall plan for a book devoted to Overlook? KS: I have enough stories for three books: a collection of novella length mysteries, in which the characters have no chance of discovering the truth but the astute reader can; an “Overlook Book of Days” – occasional stories for Christmas, Halloween, Valentines day, etc; and a miscellaneous collection that presents Overlook at various times in the last hundred years, though the characters are always the same and always the same age. CD: Each story begins with an unusual happening. How much is this based on truth? KS: Most started with a story I heard, or an image I saw. But when I sat down to write and let the characters loose, reality was left behind. Overlook is the characters who live there. One story starts with a line I heard somewhere: “It’s like this - you ever take a coupla hacksaw blades and draw them one acrost the other?” When I decided who was asking the question, of whom, and where they were, the story took off and became a mystery: The Body in the Boxcar. In southern Oregon I heard a story in a town with two churches, one of which would build a Halloween ghost house for the kids every year. One time a new minister moved into the other, more fundamentalist church and declared Halloween a pagan ceremony and ordered his parishioners to not only ignore it, but to prevent their neighbours from celebrating it, too. The minister was obliged to leave town. That’s the basis for Overlook and the Otherwold, but once the characters started to populate the story… all hell broke loose. I do enjoy a good story, with a beginning and middle and an end and unpredictable events occurring between interesting people – and I find the most fertile seeds are found in the soil of real life. CD: You seem to have a fondness for the American small town - and yet I gleaned a sense of doom about Overlook - as if its days are numbered. Is this true about towns like Overlook in the US? KS: Yes – Creeping Mall is everywhere… Overlook, too, is being dragged unwillingly into the present. The stories are ultimately nostalgia, for a past that never happened. CD: Which other writers of small town America/ UK do you admire and why? KS: Faulkner, Faulkner and Steinbeck. And in the UK, P.D.James and Dylan Thomas. KS: I rhyme. I saw them cooked by the hundreds on simple grills over outdoor fires in the south of France. In Oregon, where it rains all the time, they are as big as pork sausages. KS: Giving this interview, of course. Although I received the first Masters Fellowship given by the Oregon Regional Arts and Culture council, based on a body of work, and that was pretty affirmative. And Roastbooks put my first Overlook story to be published into print. (I have the odd fantasy about people I went to school with or fell about in pubs with spotting The Cloverleaf Development on a rack in an airport somewhere and saying, “I know that name…) And I was present at my son’s birth and did not faint. KS: I lived in a cave on Crete for three months in 1969 – I’ve never been the same since. KS: The streets of Bombay. Ex-president Bush’s “shock and awe” bombardment of Bagdad. And the ugliest was his daylight robbery of the presidency from Al Gore in 2000, as a direct result of which we lost eight possibly critical years in the climate change crisis – that’s a crime against the planet. KS: Talk to myself in funny voices. What a funny man - that droll brit wit. Must remember his name and read his books. Great interview - as always! Yes, I really hope someone publishes the rest of Keith's stories because both the ones I've read are excellent. "a collection of novella length mysteries, in which the characters have no chance of discovering the truth but the astute reader can"